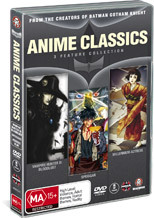 This impressive anime collection is the perfect DVD for those wishing to taste the anime genre or for those who have missed out on the movies when they were first released. The collection contains Vampire Hunter D: Bloodlust, Spriggan and Millennium Actress that are true classics. The first movie revolves around D, a vampire hunter who has been hired by a rancher to rescue his kidnapped daughter from the vampire, Meier Link. Definitely strong on action, the plot is a little clichéd in Vampire Hunter D: Bloodlust, however the gothic animation and over the top action scenes is perfect and pays homage to the mythical world of vampires and the like. Spriggan is a science fiction anime movie that revolves around a team of elite fighters that attempt to save humanity from a race of strange almost humanistic cyborgs. Unfortunately for the Spriggans and humanity, these strange beasts have discovered Noah’s Ark which not only increases their power base but threatens the very existence of mankind. With some great choreographed battle scenes, Spriggan is quite an engaging story that will have fans of the movie clamoring for more. Millennium Actress is a touching tale of lost love and when Chiyoko meets a stranger who receives a magical key, she begins her journey as an actress to find this young man again. A beautiful movie that draws elements of fantasy and reality that truly pays homage to the anime genre. In conclusion, this Anime Classics collection if brilliant and contains some of the finest anime movies available that we could recommend to even non anime lovers. Love, War and pure Entertainment is what this collection is all about!